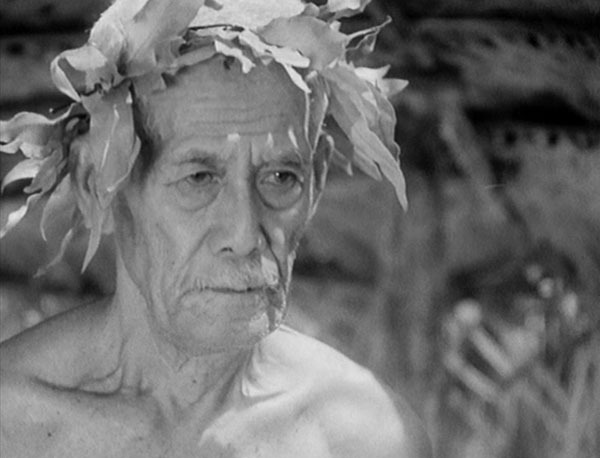 One of my new favorite movies, utterly beautiful images with a stunning restoration on the MoC DVD. I was sure that this movie would be exoticizing the islanders enough to make it unwatchable around Katy, but I showed it to her anyway, and it turned out pretty well for us. 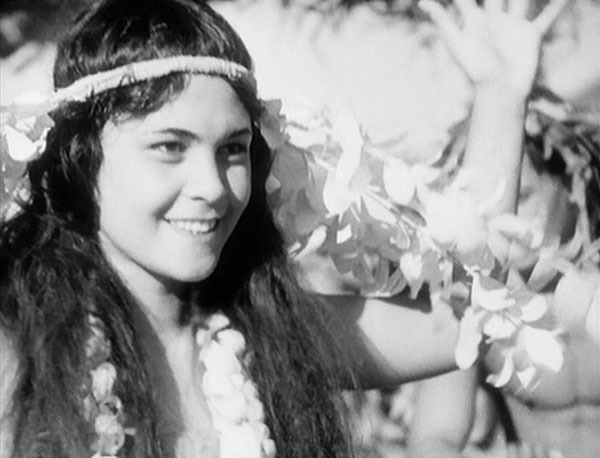 Matahi and Reri are in love, when a ship bearing aged messenger Hitu arrives with a note saying Reri is to be sent to another island and kept as their sacred virgin. So Matahi runs away with her, washing up on a capitalist island where they live peacefully for a while, Matahi not realizing that he is running up a massive debt because nobody ever explained the money system to him. 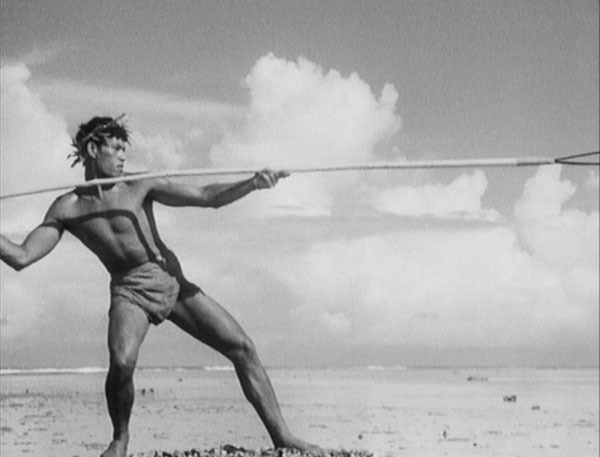 When he sees that they won’t let him leave, he braves the shark-infested waters to find a valuable pearl that will buy their freedom, but while he’s gone Hitu takes Reri, and Matahi drowns chasing after their boat. Sad movie! Tidbits from the very good commentary by R.D. 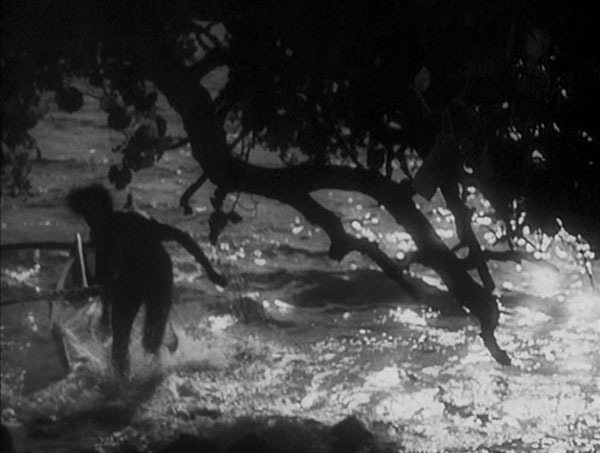 Smith and “the” Brad Stevens: Robert Flaherty directed and shot the opening fishing scene, then Murnau removed him from the project, finding his direction of drama unsatisfying. Floyd Crosby (would go on to shoot tons of MST3K fare and X: The Man With X-Ray Eyes), who worked with Flaherty on White Shadows in the South Seas, took over the camera. Story is a retelling of the Garden of Eden myth. Visual motif of descent grows increasingly darker. Contrast between motion and stillness. Islanders paddling furiously towards giant ship, their vibrant humanity vs. the faceless ship (called Moana!) which seems from afar to be guiding itself, on which sits Hitu, surrounded by stillness. The ship brings a spreading plague as surely as the one in Nosferatu. Heterosexual couple threatened by a powerful individual, theme present in most Murnau movies – in this case, central relationship is more sexual + physical than in the others. 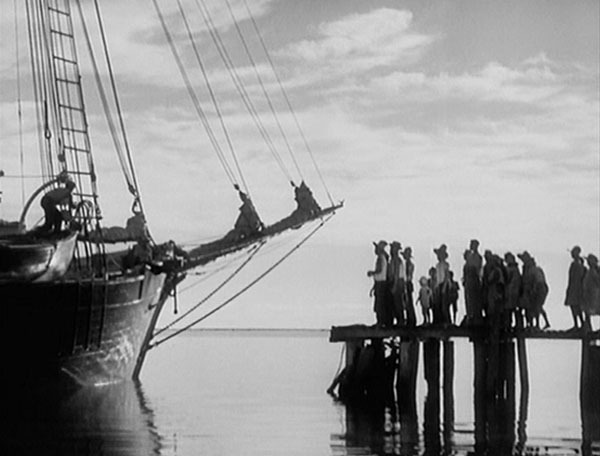 Tabu is unprecedented in Murnau, having a character attempt to oppose fate – unsuccessfully, “gives the film much of its tragic quality.” When they escape to the larger island and meet white-influenced civilization, similar to the pure-country vs. corrupt-city themes in Sunrise and City Girl. Murnau didn’t like intertitles, used none in this movie except for diegetic writings, all of which hold negative connotations. Related, should try to find sometime: Island of the Demons / Black Magic by Walter Spies and Friedrich Dalsheim.